Pentax is known for its quality prime lenses, second to none and comparable with Zeiss, Leica and Voigtlander. But one thing they have not produced are inexpensive primes for those with less money to spend. That has all changed with the introduction of the SMC Pentax-DA L 35mm F2.4 AL. Is this just a reaction to the Nikon and Sony 35mm primes? Is this too big a compromise for Pentax to make? Is it too little too late? Read on for my initial analysis, though much will have to wait until an actual lens can be used and tested. First, let's place this lens in context. Until recently Pentax offered two primes in this same focal range that were designed for film cameras and which hence covered the "full frame" image circle. The FA 35mm f/2.0 was a relatively inexpensive and popular lens, which has shot up significantly in price since being discontinued about a year ago. The FA 31mm f/1.8 Limited is an exquisite optic with price to match, out of the reach of most hobbyists. 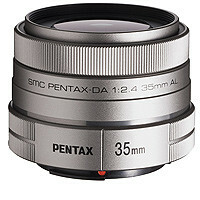 Additionally, Pentax offers the DA 35mm f/2.8 Macro Limited. This is one stop slower and covers only the APS-C image circle, but has been optimised for digital and has incredible micro-contrast and detail rendering. I owned one for a while and would recommend it heartily. The styling of the lens is new. It's lost the aperture dial and distance scales that were so essential for film work. It has a plastic instead of metal mount. And it has lost half a stop of light. So what are the advantages? First, the lens has gone on a crash diet, now weighing only 124 grams and measuring a mere 45mm in length. And it is cheaper, currently selling (pre-order) for 24,800 yen in Japan, which is under $300. However the list price in the USA is said to be $220. Unfortunately, and this is a big omission, the lens does not come with a hood! Two different hoods are available as extras, but I think this is the first time Pentax has cheapened out in this regard. There may indeed be further improvements. Changes to how the elements are polished and coated have been made on the DA Limiteds to ensure optimum image quality on digital. Certainly the DA 35mm f/2.8 Macro benefited from this, so we can predict that the new 35mm will as well. Of course it cannot be said if this lens is "worth it" until we have shot with it, seen some sample images, and possibly MTF tests and the like. However, if it does in fact turn out to be an improved version of it's predecessor, it will be excellent value for money. Many will wonder why Nikon can release the Nikkor 35mm f/1.8G at a similar price and make it a stop faster and (possibly) better built. Again, I would like to wait for comparative photos, but it is obvious that Nikon has a lot more market share and might have positioned their lens as a loss leader. No doubt Pentax suffers in comparison, if one looks strictly at the spec. Is f/2.4 too slow? Pentaxians all over the net are vociferously arguing this point as I write. But this maximum aperture is actually faster than any of the existing digital primes in the Limited line, and faster than all but about five lenses in the entire Pentax catalogue. Apples and oranges, I know, but it deserves to be mentioned that people pay over the moon for the Leica X1 and it has a f/2.8 lens. So I think it's all a matter of perspective. Yes, I would prefer an f/1.8 lens at the same price, but that might have necessitated optical compromises that I would rather Pentax not make. There are few things that can't be shot at f/2.4 in near-normal 35mm field of view. I have deliberately saved the two most significant aspects of this lens to last. 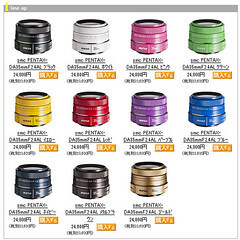 First, it comes in lots of pretty colours, the first prime lens to do so. (Of course you'll have to be living in Japan.) In my opinion this is marketing brilliance. Second, it is a kit lens! has any other digital SLR ever come with a prime as standard kit? I do not think so. By making this move, Pentax is sending a bold statement of principle that is far more interesting than the lens itself. This also means the list price of the lens is moot, since it will be bundled cheaply with the K-r body. A whole new crop of Pentax photographers will be venturing out into the world to test their aesthetic vision using a near-normal fast (ish!) prime. P.S. The US Pentax site has this spec page. Nikon d90 comes with a 35mm combo...Disney got stuck with dozens of them when they upgraded cameras from the d70 to d90. Nothing wrong with a plastic lens mount. Nikon offers cheaper lenses with plastic mounts and they work fine. I'm quite happy about the lens as I was looking for a FA 35 but they priced sky high on ebay and they are used. Here finally is a solution. I don't think most people know what they want and they simply compare what another company is doing. But for most purposes this lens will be used in program mode and it has 2.4 when shooting indoors. For me I'd use it for portraits and fashion work. Unfortunately this lens will not be part of the K-r body kit in most territories. It seems only the Japanese get the "bold statement of principle" I wrote about. What a shame. Not true...its selling on Amazon now as a kit with the Kr in the US. Well, it was true at the time I wrote it. :-) I am glad this has changed!